These sizes come standard 24 inch high, however; when a cushion is applied to the seat, it is generally 26 inch high which is also a standard height for a 36 inch high counter. It’s important to have between 10-12 inches between seat and counter top. When sitting in these, your feet generally touch the floor. For shorter persons, the ring or foot rest can be a support. 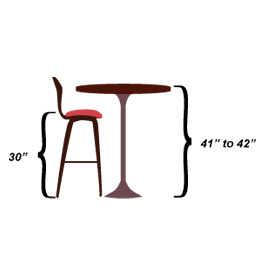 These stools are usually used for bars or high counters: 41-42 inch high and the height of stool should be approximately 30 inch (from seat to floor). The foot rest is usually the same distance from the floor as the counter height stools. The foot rest is the main support for the feet. 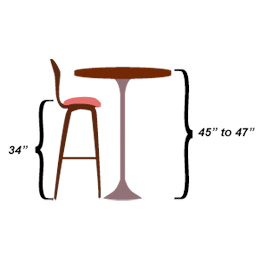 The legs or bases for this height is taller than the counter height. 32 inch height is also a comfortable height for a stool to put with a 41-42 inch high counter. A 34 inch (spectator height) is generally used around pool tables for a better view of the game. It is also used when a bar is higher than standard height 44 inch and higher. This stool is a bit harder getting into because of its height, but the footrest or arms can be used for support when climbing in. An adjustable height stool usually has a lever beneath the seat and can be adjusted by moving the lever up or down. 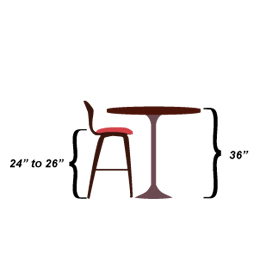 When the stool is at a 30 inch height, you must usually be seated to adjust your height to counter height (24 inch). To bring the stool back up, exit the stool and then pull the lever up. Adjustable height stools work well if you have two different height counters and want to switch the stools from one counter to the other. 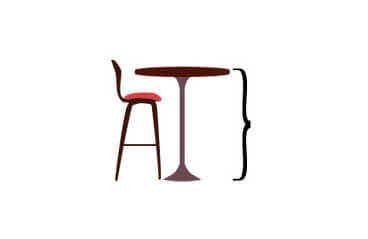 Usually these type of stools come in contemporary design and come in pedestal-based design. Vanity stools are usually used in front of a vanity sink in a bathroom or a vanity in a bedroom which is generally a little higher than a table (approximately 31-32 inch high). Vanity chairs generally run (from floor to seat) at 17 inch to 18 inch in height. 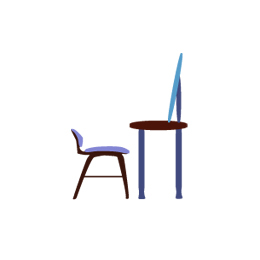 Some come swivel, some come stationary and are based used when a chair is just too low. 18 inch high stools are usually backless stools are great for smaller counters and can be just a little than chairs.